Do I have a claim for an auto accident? Should I hire an experienced Personal Injury Lawyer in Tampa for my car accident? If you or a loved one has been injured in a Tampa car accident, the attorneys at Fernandez and Hernandez may be able to help you gain compensation for your injuries and losses. Our Tampa accident lawyers were born and raised in Tampa and, in order to best represent the people of Tampa in times of need, we only take on cases with legitimate claims for injuries. Not only do our attorneys have vast experience in their fields, they have also recovered millions in verdicts and settlements against negligent automobile drivers and other parties. If you are ready to meet your Tampa Injury lawyer, feel free to schedule a free case evaluation right away and why you should hire an attorney. In addition to showing that you have been injured, your attorney must also establish, through credible and relevant evidence, that the other party is legally responsible for your injuries. By legally responsible, we need to prove that the other party was negligent (at-fault), that you are injured and that your injuries were caused by the other party’s negligence. As a result, a lot of work goes into investigating the circumstances of your injury. (c) “Negligence action” means, without limitation, a civil action for damages based upon a theory of negligence, strict liability, products liability, professional malpractice whether couched in terms of contract or tort, or breach of warranty and like theories. The substance of an action, not conclusory terms used by a party, determines whether an action is a negligence action. These cases hinge on your Tampa Injury attorney providing a clear picture of failure on someone else’s part to act reasonably when it comes to being careful. For example, if someone driving a vehicle was negligent for any number of reasons – running a stop light, texting while driving, etc. – they have failed to act with the care needed to be driving the vehicle, and your attorney can work to prove that an injury in a car accident was a result of that negligence. How Can Fernandez and Hernandez Help Me? Dedicated to protecting the people, not the powerful, Fernandez and Hernandez established itself as a leading personal injury law firm. Our Tampa injury lawyers play a vital role in the firm’s success, recovering millions on behalf of their clients. We put people over profits. Our Tampa injury lawyers work on a contingency-fee basis, meaning we only get paid if you collect, with the fee being a percentage of what we collect for our client’s in the settlement. Until then, you don’t have to deal with costly hourly fees. Remember, we get paid if you get paid, when you get paid and the more you make, the more we make. If you do not have an experienced lawyer who is skilled in the area of law in which your case falls, you are putting your future at risk. While many lawyers will try to make you believe that they can handle any auto accident or mislead you into believing that all personal injury cases are the same – and therefore that they can handle any personal injury claim type – the truth is, each area of personal injury law is distinct and should be thoroughly understood by your Tampa injury attorney. For example, the laws surrounding premises liability would not apply to a car accident claim, just as the theory of strict liability would rarely apply to a car accident case. Knowing legal nuances, statutes, and relevant case precedent can make or break a claim. Hiring an attorney that concentrates in auto accidents. Be weary of the Tampa lawyer who claims to handle six or seven areas of the law. As they say, “jack of all traits; master of none.” This is your life or liberty, why risk it with an inexperienced attorney? 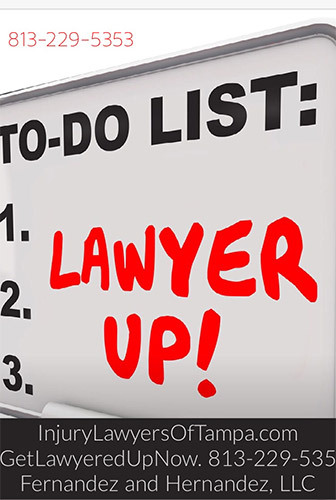 Be sure to hire an experienced attorney. More than just knowing the laws pertinent to your case, however, an attorney with specialized skill set will likely also have a experience working with other specialists and experts in that field, negotiating with insurance adjusters, and even litigating in court. Only an experienced attorney will be able to evaluate your situation and determine whether you have grounds for a lawsuit. To find out whether you can take legal action, contact us today by completing our free case evaluation form. If you’ve been in an accident and want a free consultation with a highly rated attorney, contact us. When you are involved in a car accident there are a few simple step one should take after a car accident. – By Tampa Injury Attorney: Martin J. Hernandez, Esq. The first thing after you have been in a Tampa car accident that you should do is to check that no one needs immediate medical attention. The Florida Department of Motor vehicle makes the following suggestions for an accident with injuries. As a responsible driver, you must never leave the scene of an accident. 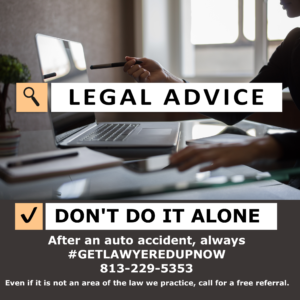 Not only is it essential that you provide any necessary help immediately following an accident, but leaving an accident scene can result in having your driving privileges revoked, your license suspended or being charged with a criminal charge. Take a moment to assess the situation, and do not panic. Be aware of the traffic situation, and any other potential dangers, such as fire. After the auto accident, immediately take pictures! This is the best evidence later on as to car positions and traffic and weather conditions. You should next document the accident with photo; video or even sketch it out. Make sure to document your car, the other cars and the road/intersection. You should stay as close to the accident as safely possible, without obstructing traffic. You should do your best to provide immediate assistance to other motorists, passengers or pedestrians that may have been injured in the accident. Take extra care when attempting to move an injured person; if possible, wait for an ambulance to arrive. Notify 911 to report any injuries and call for medical assistance. If the accident did not result in any injuries, inform the local Florida police. If you have been injured in a car accident, it is important to stay calm. If possible, ensure that you are out of danger and not blocking any oncoming traffic. Call or wait for help, and do not attempt to move if you are unable to do so. If you are in a crash with an unattended vehicle or other property, you must make every attempt to locate the owner and notify law enforcement. If you can’t locate the property owner, you must leave a note including your name, contact information, and license plate (registration) number. You should seek out medical services for any injuries that you have sustained in the accident. There is a limited amount of time to claim for an injury caused in a car accident. Some car accident injuries may resolve within a matter of days without any medical treatment at all. More serious injuries might become permanent and result in some level of physical disability. What type of injury you sustained depends on what type of doctor you should go to. Was it a low-speed collision of a high speed crash? Did the car have air bags? Did the car get hit form he from, rear or side? Was the occupant facing straight ahead in the seat or was the person head or body turned in a certain direction. You should also seek the services of a Tampa Injury Attorney to assist you. The processed of working your way thought your insurance can be confusing and highly frustrating. Not knowing how to navigate your insurance policy, talking to adjusters who do not have your best interest in hand, determining which doctors will assist you, and how to obtain the true value of your injuries are just some of things that can exasperate people injured in a car accident. To make it worse, someone else put you in this situation. How any cases do you have and how many have you won? Understanding what the attorney fee structure is beforehand. If you’re a driver involved in a car accident in Florida, and the crash resulted in injury or death, and/or vehicle damage or damage to any other property in an apparent amount of at least $500, you must report the accident to the local police department, if the accident occurred within a municipality. If the accident did not occur within a municipality, you must report the accident to the office of the county sheriff or to the nearest office or station of the Florida Highway Patrol. These rules can be found at Florida Statutes § 316.065. What’s the difference between a Chiropractor, MD and DO? After a car accident, you’ve got back or neck pain or something else. Who do you see? Your Tampa car accident attorney knows who to recommend you to, but what’s the difference? Your mom gives you the name of a medical doctor (MD), while a co-worker suggests that you go to a doctor of osteopathic medicine (DO). Meanwhile, a friend swears by her chiropractor. How do you pick? Who is best to help you get better after your Tampa car accident? Get to know each of these fields so you can make the best decision for your health. DOs and MDs are both physicians who can practice in any area of medicine. Many are primary care doctors, but there are also DOs who specialize in dermatology, cardiology, psychiatry, and other medical fields. All doctors — MDs and DOs — can prescribe medication and train to do surgery and physical therapy after a car accident. They have similar training, too. First come 4 years of medical school. After that, MDs and DOs work as interns, residents, and, for some, as fellows in their chosen field for 3-8 more years. More than 20% of medical students are studying to become DOs. They both also have to pass national exams to receive a license to practice medicine. But they’re not completely alike. What’s the difference? During a routine visit with your doctor, a DO will most likely check on your whole body, not just any symptoms you have. You may hear this called a “holistic” approach. Osteopathic doctors get extra training in the musculoskeletal system (your muscles, bones, and joints). This knowledge helps them understand how illness or injury can affect another part of the body. DOs also learn something that MDs don’t: osteopathic manipulative treatment (OMT). They use their hands to help diagnose, treat, and prevent illness and injury. They can even adjuster you if you ask! It’s a key part of their medical training. Not all DOs use OMT routinely. But when they do, they apply techniques such as gentle pressure, stretching, and resistance to help restore range of motion and encourage good health. Like DOs, chiropractors focus on the entire body and how different bodily systems work with each other. They also use their hands to diagnose and treat people. They do “adjustments” to correct alignment, improve how the body works, and restore health. But chiropractors do not have the same medical training as MDs and DOs. They can’t prescribe medicine or do surgery, for instance. Instead, their expertise is doing adjustments, recommending exercises, and offering nutrition and lifestyle advice. What are the most common types of injuries in a rear-end collision? By: Your Tampa Auto Accident Attorney, Martin J. Hernandez, Esq. There are many types of injuries people suffer in a car accident, particularly in rear-end collision. Rear-end accidents often take victims by surprise, throwing them backwards and then forwards. This happens suddenly as they idle at a stop light or coming to a stop in traffic. While many rear-end accidents allow the victims to walk away with no injuries at all, there are several common injuries that can be very serious and sometimes manifest (develop) overtime. These are the five most common injuries sustained in a rear-end car accident. One of the most common auto accident injuries, flexion/extension injuries occur to the soft issue of the spine, caused by extreme jolting of the body. This type of injury takes fairly heavy trauma, as many people endure roller coasters and sudden fall without problem. The body is able to handle normal movements and even movements slightly outside the extreme, but when a car unexpectedly rams into your car, even at low speeds, the sudden snapping of your head forward and back can place unusual pressure on your spine, causing damage. Symptoms of these injuries include pain between the shoulder blades or neck, headaches, dizziness, and even vision impairment. Because of the adrenaline rushing through your body immediately following your accident, you may not experience symptoms right away. In fact, some victims do not realize they have this injury for days (or even weeks) following an accident. Because these injuries can cause very painful symptoms, experts recommend seeking medical help as soon as symptoms begin. Don’t forget about Florida’s 14-day rule. Herniation occurs when the outer fiber surrounding a disk becomes torn, usually due to trauma. A patient can experience a herniated disk in the cervical or thoracic region, but spinal disk herniations usually occur in the lumbar region. In serious cases, a patient may experience severe back pain, numbness, tingling, and, in some cases, paralysis. This is a less common type of rear-end auto accident injury, with neck and back injuries far more common. Brain injuries most often happen in front-end and side collisions, where more direct impact usually occurs. If a passenger or driver in the impacted car is not wearing a seatbelt, there is a higher risk of brain injury, especially if the head hits something. While traumatic brain injury may not be as common as spinal injuries in rear-end collision, they can be extremely severe when they do occur, with victims risking permanent damage and even death. Many people think a broken leg or arm is nothing severe. Simply set it in a cast and heal within a specified period of time. However, bone breakages can be extremely severe, especially in the case of rear-end auto accidents. Broken bones can lead to complications such as injuries to organs and incorrectly fused bones, leading to lifelong limb deformity. Even in the case where a bone heals correctly, the patient may continue to experience decreased functionality in that particular limb, sometimes permanently. With any head trauma, medical personnel will watch for symptoms of a concussion. As with the aforementioned brain injury, a concussion is most often at risk in a rear-end collision if the accident victim’s head struck something, like the dashboard or windshield. A concussion occurs when a person’s brain strikes his or her skull, causing an injury. Concussions are like other auto accident injuries in that they don’t necessarily reveal themselves at the scene of the crash. In fact, physicians will often recommend family members watch head trauma victims for at least the twenty-four hours following an accident. Symptoms include headaches, blurred vision, dizziness, inability to concentrate, and sensitivity to sounds and light. At first suspicion of a concussion, a patient should seek medical treatment immediately, as serious complications could follow. This makes rear-end collisions one of the most common types of auto accidents in the country, and a leading cause of accidental injuries. These injuries cost Americans millions of dollars in medical fees, rehabilitation, and lost wages every year. If you’ve been in a rear-end auto accident, consider that symptoms can lead to permanent damage if left unchecked. It’s vital to watch for symptoms of head injury or back injury and seek medical attention if you suspect serious damage has occurred. If you do not have a doctor to evaluate and treat you for your injuries from your car accident (rear-end collision), ask us today for a list of doctors near you (home or work).